181 photos from New York 1969 and 50 lyrics in English from then and now. ISBN 978-3-944667-17-1 5,99 € E-Book (pdf - 137 pages) - best choice. Impressions provoke expressions. Then as now. In this book we seated both at the table. Both of each sentence and both sentences together. So to say we made it a foursome. And not to forget we both as authors. Nearly a crowd. 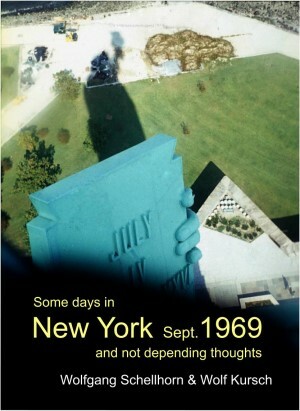 The book contains circa 181 photos of New York in the late summer of 1969. Impressions of a tourist just absorbing the city. No valuation. Just catching everything in sight. The result were a 3,500 pictures in about three weeks. Most of them are made with a 8mm camera, some with a 35mm camera. Perhaps not the best of quality, but documenting the time. Days as were. On the other hand there were lyrics, poems and thoughts of then. Written in those times. A bunch of recently written are added. Thoughts as were. The circa 50 lyrics were written without knowing of the photographs and vice versa. They met by hazard. This book is not about New York in 1969, it is about strolls in New York of 1969 with glimpses here and there. And it is about thoughts – timeless perhaps – that can be made by everyone. Thank you for buying a legal copy of this e-book.